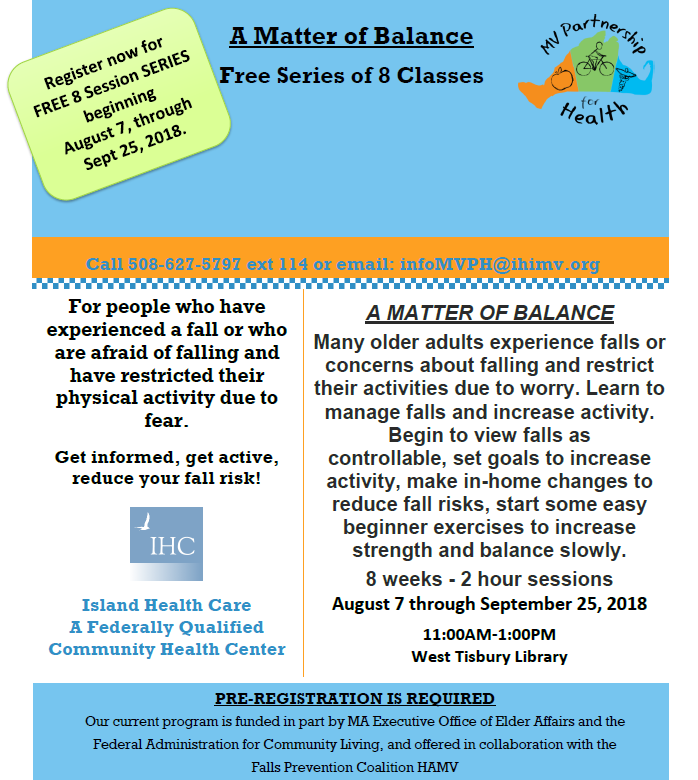 Island Health Care will offer a series of eight classes recommended for people who have experienced a fall or who are afraid of falling and have restricted their physical activity due to fear. Get informed, get active, reduce your fall risk! Many older adults experience falls or concerns about falling and restrict their activities due to worry. Learn to manage falls and increase activity. Begin to view falls as controllable, set goals to increase activity, make in-home changes to reduce fall risks, start some easy beginner exercises to increase strength and balance slowly. PRE-REGISTRATION IS REQUIRED. To register, please call 508-627-5797 ext 114 or email: infoMVPH@ihimv.org.